Last week I had the opportunity to get my hands on the Nexus One and play with it for a bit. Here's a size comparison. 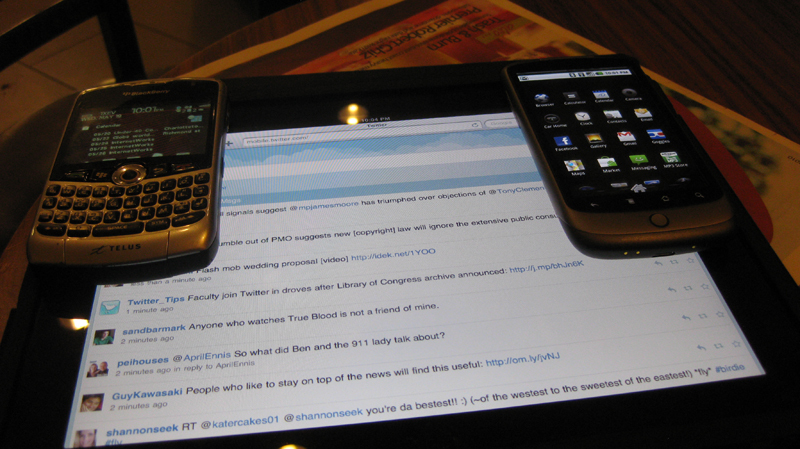 On top left is the Blackberry Curve 8330, then in the middle/on bottom is the Apple iPad and on top right is the Google Nexus One. After playing with the Nexus One for a few minutes there was a few items I did not like such as typing on it. My fingers must be too big or its really hard to type on the Nexus One (I had the same experience with the Storm2). The other feature I did not like was that when I rotated the Nexus One, the screen did not adjust as well. After spending a few minutes looking it up, the system settings showed it was suppose to rotate so we might have been doing something wrong. However it wasn't a simple process like it is with the iPad.